By our definition, this sector essentially covers, cosmetics, vitamins and health supplements, soaps, detergents and household chemicals, perfumes and flavors. These chemicals are normally sold in relatively small quantities so they are more protected from pricing pressures. It is a sector on the brink of a new era where supply chain and operational efficiency at all levels will prove vital to companies’ ability to bring new products to market safely and more quickly than the competition. Growth is reliant on the increasing affluence of populations in emerging and growth economies and margins are being eroded through greater regulation in areas of environmental impact, public health and workers’ welfare. There is also a need to reduce dependence on non-renewable resources and to develop new value-add products in response to changing consumer demand. 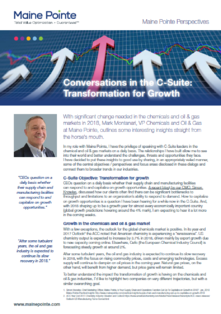 In this shifting market, consumer chemical companies are increasingly looking for cost synergy opportunities and enhanced operational scale. Companies also remain actively focused on increasing their reach in high-growth markets in a bid to cut their exposure to businesses that are struggling with depressed demand. Strategic measures including cost management and productivity improvement also remain the prime focus of these companies to stay afloat in a, still difficult, global economic backdrop. This is where our Total Value Optimization™ approach proves to be a far more scalable and comprehensive approach than a mere cost reduction exercise, because it balances cost with value. Currently, the key focus of the major players in the global consumer chemicals market is on mergers and acquisitions to expand their geographical presence. In a highly competitive global market, acquisition companies will need to be well prepared for pre-acquisition operational due diligence, post-acquisition integration, centralization and synergy cost reduction. They will need the expertise to execute strategic asset disposals. At the same time, companies will need to prepare themselves for acquisition by driving cost reduction, rationalization and spin-offs of non-core / orphan assets. Maine Pointe has found that strategizing with senior management pre-merger has helped them to accelerate synergies. We can uncover supply chain and operations-oriented value creation opportunities that enable you to quantify EBITDA improvements, together with working capital risks and opportunities. New technologies based on nanomaterials will be at the forefront of future advances in the chemical industry. A large number of products containing nanomaterials are already on the European market (e.g. batteries, coatings, anti-bacterial clothing, cosmetics, food products). Nanomaterials offer technical and commercial opportunities, but may pose risks to the environment and raise health and safety concerns for humans and animals. This industry sector is entering an exciting phase of development where the risks and opportunities are very significant. Smart companies are adopting a dual strategy of increasing cost savings and raising product prices where viable to fund increasing R&D costs. In addition, serious investments are needed in automation, information technology and data analytics. A premier cosmetics formulator that provides manufacturing services to the beauty industry.